The agribusiness financing scheme known as the Agribusiness Small and Medium Enterprises Investment Scheme (AGSMEIS) is a voluntary initiative of the Bankers’ Committee to support the Federal Government of Nigeria’s efforts and policy measures for the promotion of agricultural businesses and small and medium enterprises (SMEs) as vehicles for sustainable economic development and employment generation. Team Lead from Sterling Bank; Mrs Bukola Awosanya addressing the participants at the workshop. 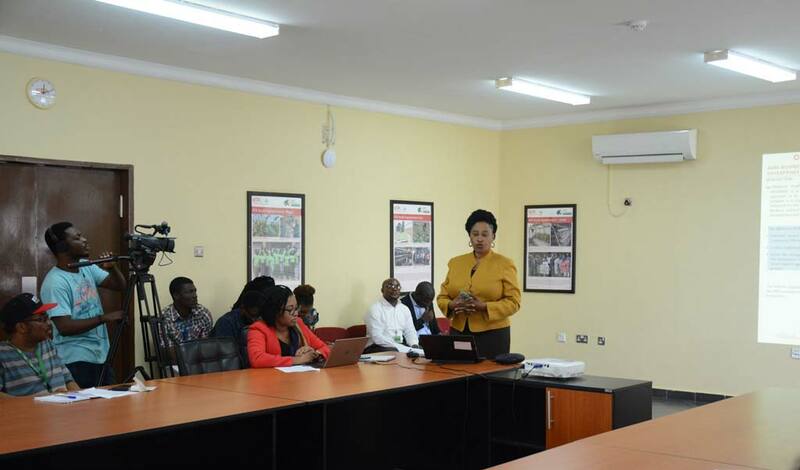 In view of this, a six-person team from Sterling Bank visited IITA’s headquarters in Ibadan, Nigeria on 16 August to conduct a sensitization workshop for the Institute and the IITA Youth Agripreneurs on the loan scheme. The loan scheme, with a 5% interest rate, has the capacity to provide up to 10 million naira (about $27,777) to a potential beneficiary with a loan tenure of seven years and moratorium of up to 18 months for the principal and 6 months for interest. Enlightening the participants, the team lead from the bank, Bukola Awosanya who is also the Group Head, Agriculture and Export Finance, said that the scheme is targeted towards improving access to affordable and sustainable finance by agribusinesses and micro, small and medium enterprises (MSMEs), creating employment opportunities in Nigeria, and boosting the managerial capacity of agribusinesses and MSMEs to grow into large corporate organizations in line with the Federal Government’s agenda to develop the real sector and promote inclusive growth. She added that business owners across the agricultural value chain covering production, input supply, storage, processing, logistics, and marketing, MSMEs in manufacturing, mining, and petrochemicals and in the service sector such as information and communication technology (ICT) and the creative industry are eligible for the loan. They are, however, expected to go through business development training from the Central Bank of Nigeria’s recognized Enterprise Development Centres (EDC and Enterprise Development Institutes (EDI). Recognizing the role that IITA has played over time in promoting agriculture across the African continent and grooming young entrepreneurs in agribusiness, Sterling Bank has identified the Institute as a potential EDI, that is required to send a list of trained and profiled beneficiaries to CBN for review. The workshop was attended by some IITA management staff, IYA Agripreneurs and trainees, and representatives from EKIMIKS Ltd and the Hello Tractor project.